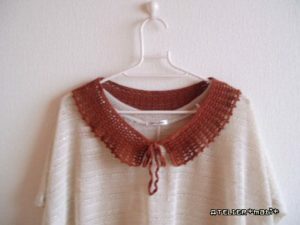 This all seasons collar suitable for any type of yarn. Instead of string, you can use favorite pin or flower corsage. Row1 : ch162, 1sc in 2nd ch from hook and in each ch. Turn. Row2 : ch3(count as dc), [skip 1sc, (1dc, ch1, 1dc) in next sc, skip 1sc] repeat, end with 1dc in last sc. Turn. Row3 : ch3(count as dc), [skip next dc, (1dc, ch1, 1dc) in next ch1 sp, skip next dc] repeat, end with 1dc in top of ch3. Turn. Row4 : repeat row3. Turn. Row5 : ch3(count as dc), skip next dc, (1dc, ch1, 1dc) in next ch1 sp, skip next dc, [ch1, skip next dc, (1dc, ch1, 1dc) in next ch1 sp, skip next dc] repeat, end with 1dc in top of ch3. Turn. Row6-8 : repeat row5. Turn. Row9 : ch3(count as 1dc of dc2tog), skip next dc, 1dc(count as 1dc of dc2tog) in next ch1 sp, skip next dc and ch1 sp, [ ch2, skip next dc, (1dc, ch1, 1dc) in next ch1 sp, skip next dc and ch1 sp] repeat, end with ch2 and dc2tog in last ch1 sp and in top of ch3. Turn. Do not fasten off. Start with Top row: Ch1(do not count as sc), sc in next dc2tog, 2sc in next ch2 sp, sc in next dc, [sc in next ch1 sp, 1pic, sc in next dc, 2sc in next ch2 sp, sc in next dc] repeat to the corner. Right side : sc in each dc/ch3 sp and end with sc in side of sc of first row. String and bottom row : ch71, sc in 2nd ch from hook and in each ch to end, then ch71, sc in 2nd ch from hook and in each ch. Left side : sc in side of sc of first row and in each dc/ ch3 sp, join with sl st in first sc.